Growing up with a big brother, it was inevitable that Erin would become fond of Elliot's toys at playtime. Of course she has her own big toy box full to the brim of age appropriate toys but right now, some of her favourite items include the plastic dinosaurs (of which we have many!) and the vehicles. She especially likes the "neenaws"! Fortunately Elliot has a big box full of vehicles so she is always sneaking off to Elliot's bedroom to have a rummage in his toys! Brio is one of those reliable brands where you know exactly what you are going to get. The toys are predominately wooden and always of a high quality - and they are the type of toys that never go out of fashion! Brio also guarantee that all their wood is from FSC certified sources - which basically means that all the wood they use is traceable and originates from responsibly managed forests. 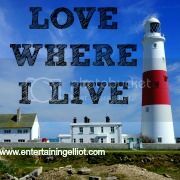 The My Home Town range is a fantastic set, just perfect for sparking the imagination. Featuring farmers, policemen, camping sets, trains and much more, the figures let you try out different careers. 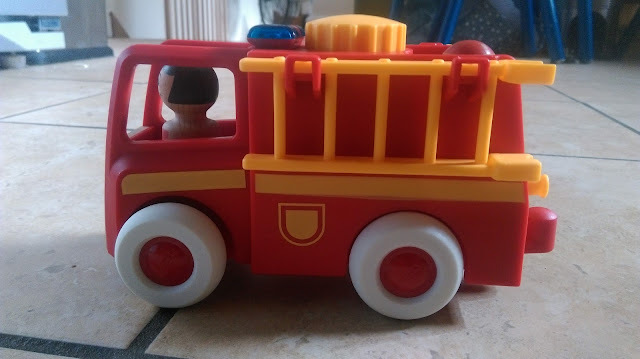 The range is suitable for children 18+ which is great, so many toys are for 3+ and they are at that inbetween stage where they are growing out of the baby stage toys and not quite ready for the pre-school toys! 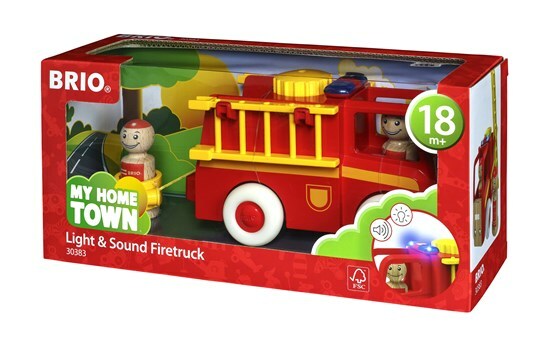 Our Light and Sound Firetruck is made of sturdy wood and plastic and features a working siren that is activated by a simple button on top. It comes with a fireman and fire lady - these are both wooden and have no moveable parts, these are perfect for little hands. There is a firehose which can be reeled in and out and the fire people can be popped into this. Lastly there is a removable ladder. We were really impressed with the set and it has got a lot of play since it arrived. Erin loves pushing it around and turning the siren on, but Elliot has also enjoyed playing with it along with his other Brio vehicles. I am sure this toy will continue to be a popular with Elliot and Erin and I'm pretty sure we will be adding to our Brio collection very soon!